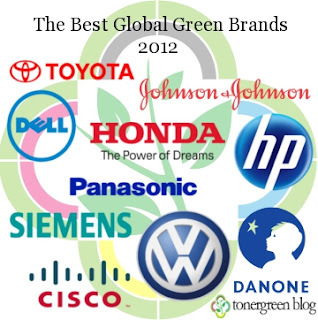 The Best Global Green Brands 2012 | TonerGreen - Eco-Friendly Toners from the U.S.
Interbrand is the world's largest leading brand consultancy that specializes in vast brand services including brand strategy, brand analytics, brand valuation and naming. Using its five-step discounted Economic Value Added methodology, Interbrand releases an annual ranking of the best global brands in the business industry and is published in the Business Week. And just this June 26, Interbrand releases their Best Global Green Brands list for the year 2012. And TonerGreen blog, a green blog site which promotes environment conscious printing using remanufactured toner cartridges and inkjet cartridges, is going to give you the Top 10 Interbrand's Best Global Green Brands for the year 2012 to keep you updated. These brands were judged on a wide range of criteria including environmental programs, performance in measuring reporting and mitigating the environmental performance of their supply chain, the green attributes of the company's products and of course, sustainability. Toyota - is an automotive multinational company based in Aichi, Japan. Toyota is considered as the world's largest automobile manufacturer and the ninth largest company in the world by revenue. Toyota tend to follow five principles in every business transactions: (1) challenge, (2) improvement, (3) go and see, (4) respect and (5) teamwork. Johnson and Johnson - is a known American manufacturer of medicinal devices, pharmaceutical and consumer packaged goods. It was ranked as the world's most respected company by the Barron's Magazine and was the first corporation who was awarded with the Benjamin Franklin Award for Public Diplomacy. Honda - another Japanese international automotive company that was considered as the world's largest motorcycle manufacturer since 1959. It is also regarded as the world's largest manufacturer of internal combustion engines, producing 14 million internal combustion engines each year. Volkswagen - is a famous German automobile manufacturing company found in May 28, 1937 headquartered in Wolfsburg. Hewlett-Packard - is another renowned OEM manufacturer of printer brands founded by Bill Hewlett and Dave Packard based in Palo Alto, California. It also provides software, solutions, laptops, cameras, and other machines for SMBs and large corporations. Panasonic - the third Japanese top corporation that made it in the list. Formally known as the Matsushita Electric Industrial Co., Ltd. based in Osaka, Japan, focusing in electronics manufacturing. Dell - an American computer technology corporation based in Texas that develops and sells computers, related products and services. Siemens - the second German multinational company based in Munich, is the largest Europe-based electronics and electrical engineering company. Danone - is a Spanish-French food-products corporation that is best known for its dairy products, cereals and biscuits, baby foods and bottled water. Cisco - a multinational corporation based in San Jose, California which designs and manufactures networking equipments.